Episode 72 of The Independent Characters takes a long and hard look at White Dwarf of the past, present and future. Over the years White Dwarf has provided endless pictures and articles about the Warhammer Fantasy and Warhammer 40k Hobby (as well as other Specialist Games by GW). However, in recent years the magazine has come under a high amount of criticism that it is nothing more than a “Catalog for GW”. Additional criticism generaly points to how the magazine in the past was so much better than it is today. White Dwarf has recently gone through an update of their magazine, and we have recently come into possession of a HUGE amount of back issues thanks to our buddy Ken. So we thought this would be the perfect time to put the magazine to the test. 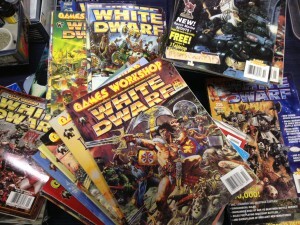 Was it truly better in the past, or do we look back at the official magazine of Games Workshop through rose-tinted glasses? We answer that question as well as provide hobby progress updates and games played over the last two weeks. NOTE: Our Forbidden Lore Segment on Ahriman: Exile has been delayed one episode as this one ran incredibly long. Sorry about the last minute notification.